The arrival of beautiful foliage means that the change of seasons is upon us and, although the past weeks in NJ have been unseasonably warm, we should prepare for cooler days. When the temps drop the trees might undress, but we like to bundle up! So, a favorite must have item for fall is an army or military inspired green, lightweight jacket. Because they're light weight they are perfect for fall or spring and great for layering over thin tees or sweaters! We've been seeing this look everywhere, varying from feminine flair to rugged chic. Just think of the 90's grunge scene, but pretty. One of our favorite looks is this cinched anorak by BDG. It's large hood makes it perfect for shielding you from the crisp fall winds, but it's lightweight enough to wear even in September. The details are what make this jacket stand out: we love the cinched waist, hidden zippered pockets, and split hem in the back. This is one fall trend that we'll definitely be sporting. 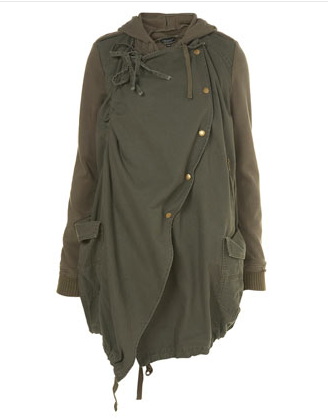 Another great casual look is this cropped military jacket from Forever 21. It also has a large hood and hidden zippers, and the cropped style makes it perfect for layering. Just throw on a buffalo plaid scarf, and you're all set for apple picking! A similar, but more polished look is this utility jacket from J. Crew. The jacket sports a comfortable knit trim collar, and is water resistant, which is handy for when you trek through the rainstorms in Nam. We also love this cropped military jacket by Ann Taylor Loft. The structured Mandarin collar and broad belt will have you marching down the streets with authority, but what really makes this jacket stand out is its deep color. Described as "burnt olive" on the website, this shade of green is rich and vibrant, which is a nice change of pace from all the faded greens. And it especially looks good on red heads, as pictured above. If you want something less casual, then try on this belted faded olive trench from Victoria's Secret. 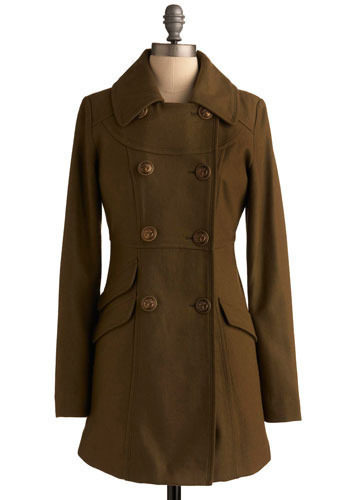 The large brass buttons and high collar give this a military feel, but the belted waist gives it a nice feminine fit. This look is great for both work and play, and is a bit more interesting than your standard khaki trench. Another fashion forward look is this lightweight parka available at Top Shop. This is a more urban take on the traditional army green, with a jersey body and cotton layers giving it a soft, cascading look. This parka would look great with leggings and combat boots (our other favorite fall trend) or with tights and heeled oxfords. Finally, we love this military inspired overcoat from Mod Cloth. Made from a warm wool blend, this is a great coat to have come November, when temperatures begin to drop and you're forced to forgo your light blazers for something more substantial. The cut of this coat makes it appropriate to wear to work, but would work equally well with jeans and booties. Loved this post! My sister had this sweet army green jacket that I somehow successfully "borrowed" from her for two years of college - and was able to hide it every time she visited me. After college I hid it in her bottom drawer and she found it thinking it had been there the whole time. I loved that jacket and she never knew aahaha.